Rafa Benitez has instilled a toughness and mental strength in the Newcastle side this season that means the lads never give up in any game and they are always trying to win it – whatever the score is. A great example of that was the home game against Norwich last year when we were 3-2 down going into stoppage time and 3-2 down after four minutes of stoppage time. But we scored two dramatic goals in the following two minutes to get a very famous 4-3 win against a top side in the division. And last week we went very close to winning at Carrow Road late in the game. None of that kind of thing happened last season and Rafa has used a number of the players from last season’s squad – they just have a different outlook on the game under Rafa. It’s a really tough four games coming up starting on Saturday against Bristol City and lasting a short 11 days – four tough games in 11 days! By a week on Tuesday night we will know what our chances of automatic promotion look like, after we have played Bristol City, Brighton, Huddersfield and Reading by then. The first thing we have to do is beat Bristol City at home on Saturday afternoon. Did he ever play that role at Bournemouth I wonder ? Looks good cutting inside and banging them across and inside the far post …just wonder how he is doing the gayle role of running on yo through balls ? As for Leicester … If it’s true the players voted him out then. Hope they go down …shower of sh@t to treat a guy that lifted a very average bunch way beyond their dreams …hang your heads and hope you drop like a stone . Claudio for me is up there with the Bobby,arsenes and Rafa ‘s of football ..deserves a lot more respect. @1 Reckon Palace will go down, have a feeling the Mackems might survive? Just a feeling, but I think Boro will go down. Is it only a 1 game suspension? Maybe an idea to play Atsu v Bristol City, to save Ritchie for Brighton? Ranieri up there with managerial elite? Why? Very few managers would turn down Arsenal, particularly if they were offered the same autonomy Wenger enjoyed. The only real reason to say no from a career perspective would be because Wenger would quite possibly be too big an act to follow, like Sir Alex at Man U. He took Cagliari from Italian 3rd division to Serie A in successive seasons. He got Fiorentina and Monaco both promoted to their first Divisions as champions. Best manager/coach in the world 2016 from numerous bodies. Just that he deserves better in the same way we treated SBR at the end . Same as arsenal fans who seem to think they have some god given right to win the title every year …I would snap there hand off to have their recond over the last 20 years . As for raneiri … Those same Leicester players need to ask where they were when Claudio took the job? Those that weren’t trying to bang hookers and trannys in Bangkok anyway . Have a read of phil McNulty on bbc …interesting about how the owners of Leicester ( King power ) were carrying on at Everton Last year after they got the prem trophy . The “tinker man” to Arsenal for a season of transition away from the Wenger era might easily be on the cards. Sorry I think the FA decided in January 2017 to change it to one match. @14, well I’m guessing you’re not my type! You probably did a fist pump and a “Gerrin” when Ashley sacked Chris Hughton. Just out of interest who do you feel is then is deserving of legend status in today’s game ? Those who are currently employed that is ? Ranieri has never even remotely been a joke. He managed Napoli, Fiorentina, Valencia, Atlético Madrid, Chelsea, Valencia again, Parma, Juventus, Roma, Internazionale, Monaco before his problems with Greece and then magically guiding Leicester to the most unlikely of Championships. He has had a fantastic career in management. Am confused mate I said Ranieri is a legend for them? as one to have a laugh about. 4 games to undermine a 25 year career at the highest level and become a joke? @21, the way it should be mate. No time for keyboard warriors. Just asked the question who you would currently think has achieved more in the game in the last two years given with what he was given to work with ? Couldn’t the same be said about rafa? He failed big time at madrid, did he become a joke as madrid fans called him boring and clueless? Having defended him, which isn’t hard given his career, I’m not about to criticise his sacking. That’s football, and if they go down, they may well be totally f@#&ed! reported – how would he ever get it back? Same sort of situation when SBR was moved out. Still spent nothing like mournino or inherited a squad like him either . To me the biggest mistake they made was not getting a bigger squad with the obvious euro games coming ( like us finishing 5 th and signing only Anita that summer) and hugely underestimating Kante . They will however now return to being a you yo club and will talk in disbelief in years to come about the year they won it . Jealous ? Me ? Yes just a little bit . It’s cliche and been said before but it’s players who get you relegated ,not the coach . If they think that they are not to blame for where they are ( last year those same players fought like lions) then they are in my book already down . I am so wishing they get pardew . Pearson would be th obvious choice in the current state but he was also given pretty shabby treatment after keeping them up. Jib @12 – Without wanting to restart an argument is that not for the Premier League – the EFL may be different? Rafa was never going to be accepted by the Madridistas. Season 2000/01 Real won La Liga by a record 7 points. 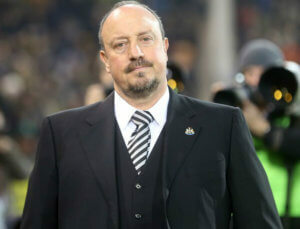 Next Season they finished 4th with the title being won by a Valencia managed by ex Real junior coach Rafa Benitez. For a madrileño to win the title for a Catalan club was unforgivable to many.